Another week and another unexpected and unwelcomed delay. 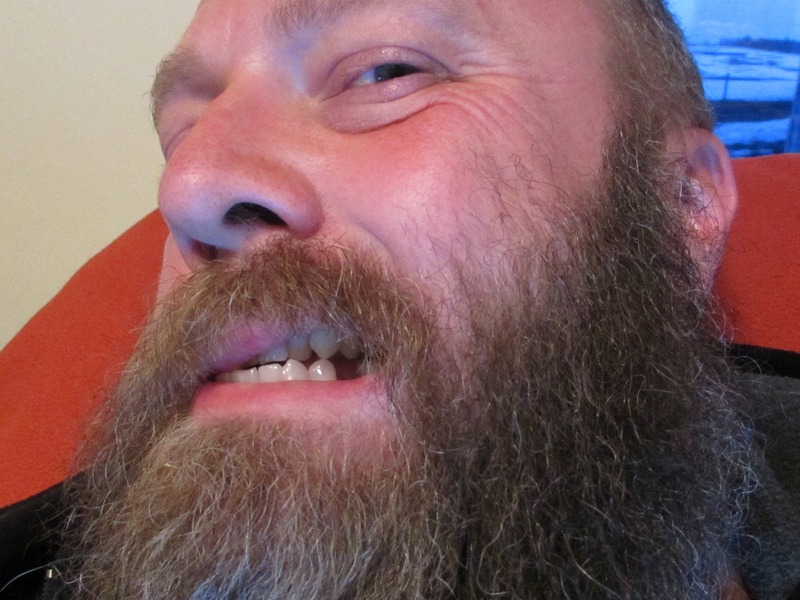 Not that it really made much of a difference with the yesterday’s rain and all, but an stray sliver of bone in last night’s dinner resulted in an emergency trip to the dentist and an extracted tooth today. So as per doctor’s orders, no heavy lifting, bending or straining that might cause the socket to bleed. That puts our demo on hold again for a day or so. The weather has been in our favor this week otherwise and we did start demolition of the back porch. We also got most of our storage out of the rear addition – readying it for demolition too. I’ll have more of that to write about shortly. So while sidelined, we distracted ourselves by starting some more of our vegetable seeds. 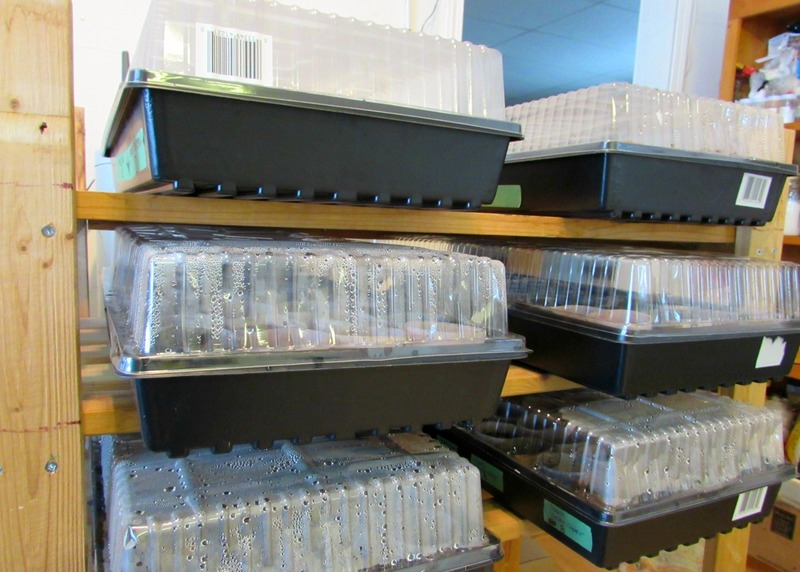 We’ve been germinating our seeds in trays set up on shelving in our kitchen. 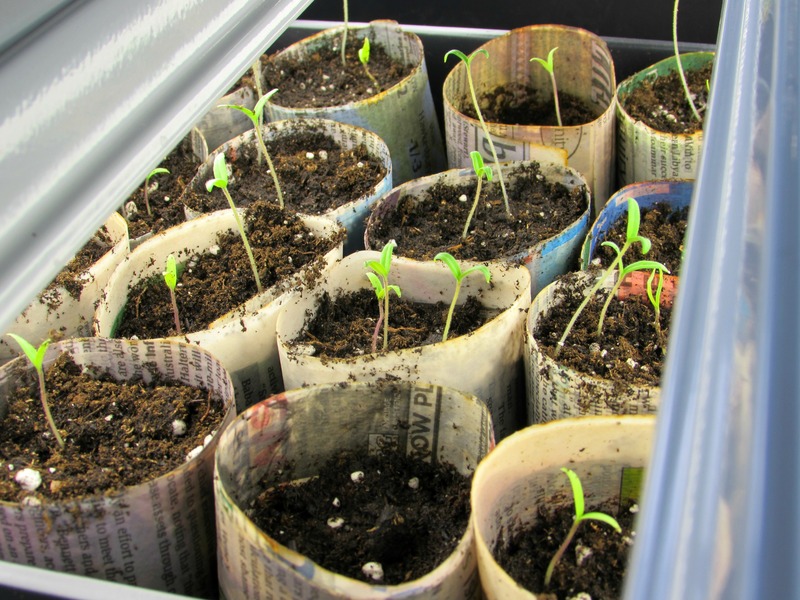 A space heater on low below the shelving provides the perfect temperature to get the seeds started and the newspaper pots reduces the stress of transplanting later – the pot and all will be planted. 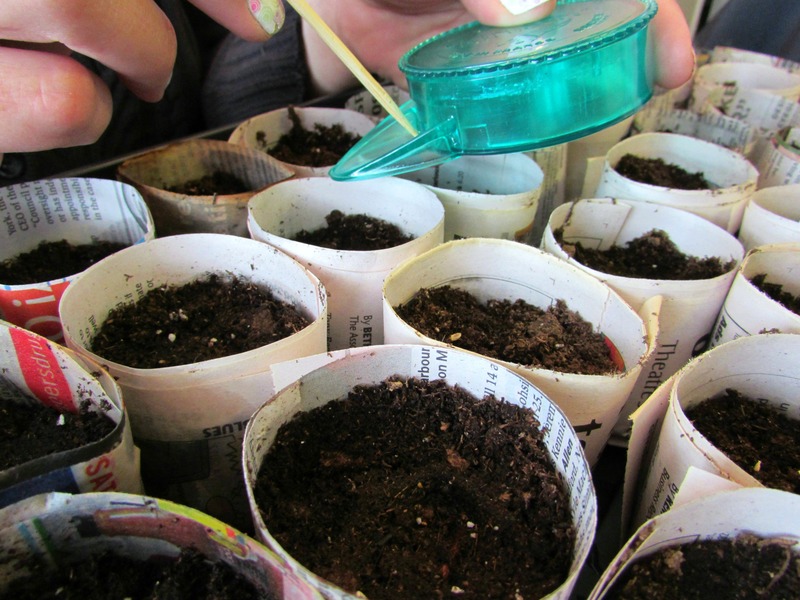 Most seeds don’t require light to germinate, but once they’ve broken through the soil, the energy stored in the seeds is used up and the small plants start reaching for light – this is when we move them to our “grow-op”. 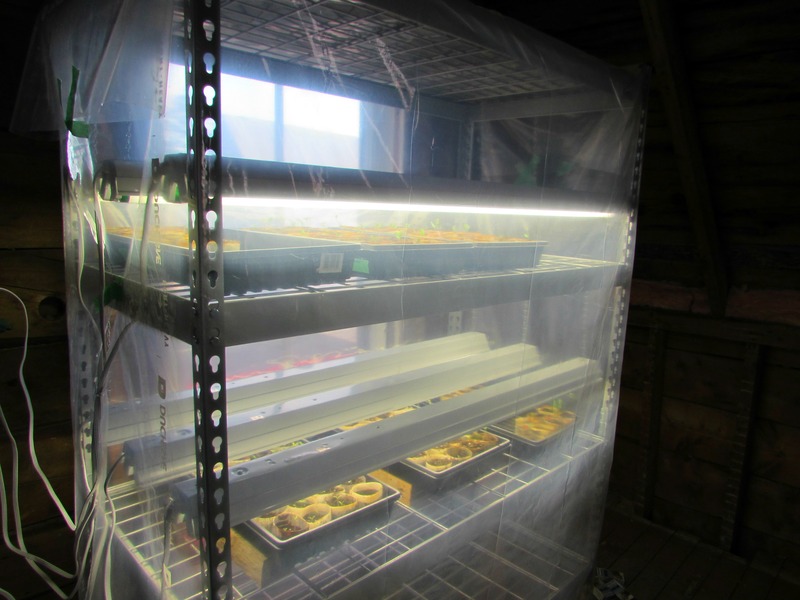 Upstairs and out of the way, we have another set of shelves equipped with fluorescent lights on a timer to provide 15-16 hours of light to the newly germinated seedlings per day. 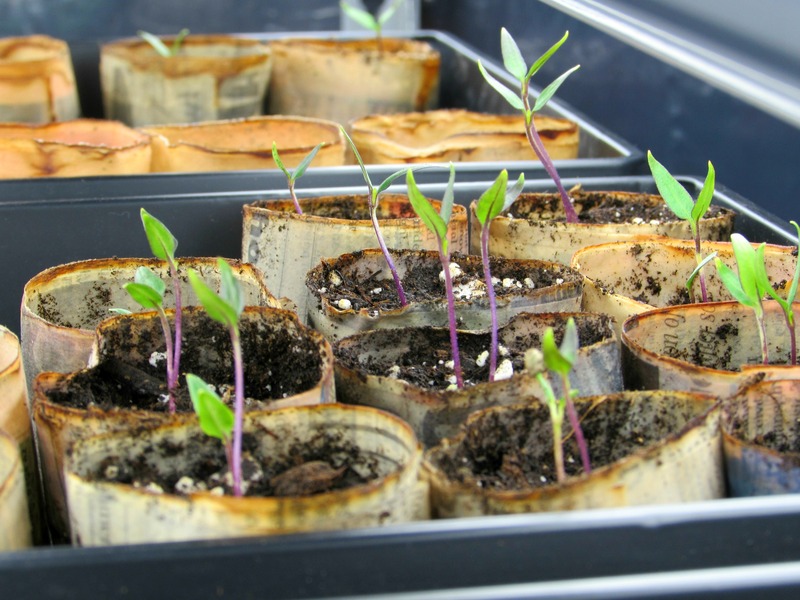 The seedlings need sufficient light to keep them from becoming too leggy and spindly. We have the lights suspended from short chains and are able to raise the lights as the plants grow upwards. 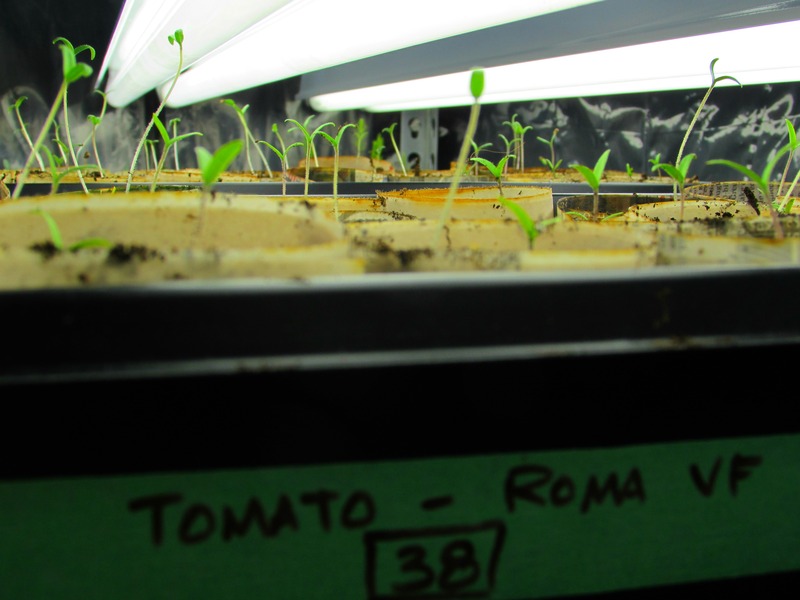 Ideally, you’d want to keep the lights to within one or two inches from the seedlings. The lights are timed to turn off around 9:00 in the evening – and it’s quite a sight to see the upper level of the house lit-up like a greenhouse at dusk. In addition to the asparagus and peppers started a couple of weeks ago, we’ve now started two flats of onions and the remainder of our tomato seeds – five varieties, totalling about 80 plants. As spring approaches we will also be starting some of our other plants – squash, broccoli, cabbage and lettuce. And with the majority of the snow gone from our garden area, we’ll soon start preparing the beds for planting by the end of May or beginning of June. That will be around the time our foundation is underway, so we’ll have time to tend the garden. 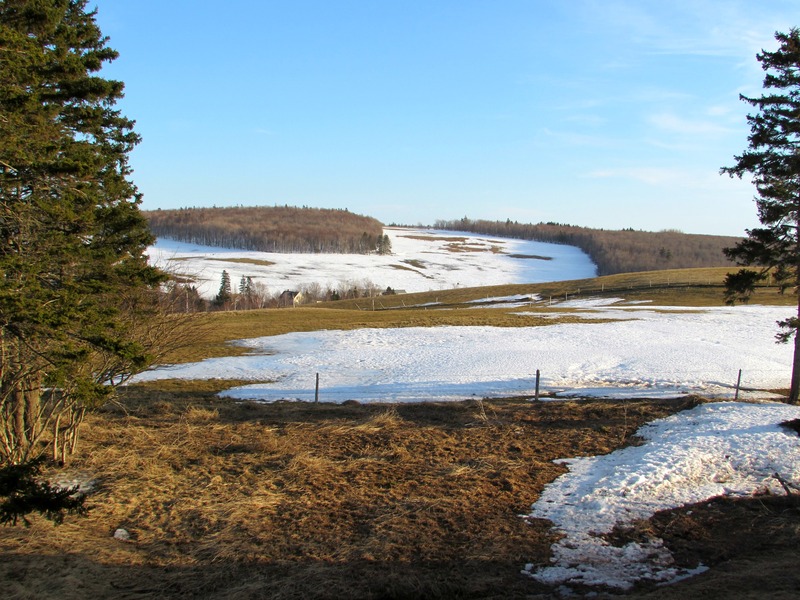 The spring thaw couldn’t have happened soon enough. Next week, fishing season opens and I’ve already told Vanessa, regardless of the weather, I’ll be wetting a line when it does. Until then, demo will resume as planned tomorrow. And a little free advice: be careful of little bone fragments when eating ribs. You’re welcome. This entry was posted in Growing In the Red Soil and tagged garden, planting, seeds, self-sufficiency, vegetables by Russ Anthony. Bookmark the permalink.